Nationally designated as a Forest Reserve in 1977 and registered as a Wetlands International RAMSAR site in 1995, the Sierpe Terraba Mangroves National Wetlands are located near the Osa Peninsula approximately 45 minutes south of Uvita – Bahia Ballena and encompass 30,654 ha. The site is entirely state-owned and managed by the Ministry for the Environment and Energy. The wetland reserve is an important habitat of many species of birds, fish (55 species), shellfish (10 commercially exploited species), mammals and reptiles. Resident and migratory bird species often found in Terraba Sierpe include Herons, Egrets, Cotingas, and Pandion haliaetus. 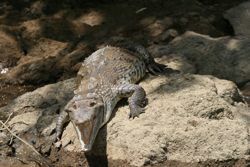 Common mammals include Agouti paca and Lutra annectens; and reptiles Caiman crocodilus, Crocodylus acutus and Tree Boas. Many of these species depend on this ecosystem for their complete life cycle; reproduction, growth and feeding. Within the Terraba Sierpe Mangroves, products are extracted by organized groups, familiies and individuals. The main income generating activity in the area comes from the harvesting of the clam Anadara tuberculosa, commonly referred to as “piangua”. There is also small scale artesanal line fishing permitted in the estuary of the Terraba Sierpe. The “pianguas” and the mangrove bark-Rhizophora harrisonnii found here have been harvested by the indigenous Terraba Indians for estimated 1,200 years. The wetland is also used by tour operators as a bird and nature tour attraction, to promote the beautiful landscape, flora and fauna. Very few people live in the Terraba Sierpe Mangroves and the main human settlements are in the surrounding communities of Sierpe, Palmar and Cortes. Nationally designated as a Forest Reserve in 1977 and registered as a Wetlands International RAMSAR site in 1995, the Sierpe Terraba Mangroves National Wetlands are located near the Osa Peninsula approximately 45 minutes south of Uvita – Bahia Ballena and encompass 30,654 ha. The site is entirely state-owned and managed by the Ministry for the Environment and Energy. The wetland reserve is a bird and nature tour attraction and host an important habitat of many species of birds, fish (55 species), shellfish (10 commercially exploited species), mammals and reptiles. Resident and migratory bird species often found in Terraba Sierpe include Herons, Egrets, Cotingas, and Pandion haliaetus. Common mammals include Agouti paca and Lutra annectens; and reptiles Caiman crocodilus, Crocodylus acutus and Tree Boas. Many of these species depend on this ecosystem for their complete life cycle; reproduction, growth and feeding. >> Get your camera ready for a boat trip through the wetlands! The Terraba-Sierpe wetland is characterized by a woodland ecosystem with periodically flooded swamps and mangrove forest, palm swamp forest, sandy beaches and cliffs and covers the mouths of the Terraba and Sierpe Rivers and adjacent lagoons of Sierpe and Porvenir. The Terraba River is the main source of freshwater into the estuarine system and it drains a basin of approximately 5,000 square kilometers. Its main tributary is the General River along with its tributaries. 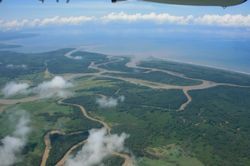 The Sierpe River, which forms the border of the mangrove woodland has tributary rivers and streams too. The mangrove vegetation of Terraba Sierpe plays a basic role in erosion protection, both from run-off and wind erosion and in maintaining water quality. Rainwater and run-off are stored in the wetland. Terraba Sierpe and its area of influence are geologically formed by materials from the Cretaceous, Tertiary and Quaternary periods. The materials are of volcanic, erosive or alluvial origin. The majority of the soils in the site have a high water content, variable salt quantities and low levels of oxygen. These soils are semi fluid, poorly consolidated, grey or black in color reflecting high sulphate content. The alluvial soils, with good to poor drainage, derive from sediments and volcanic ash. The site is periodically flooded by tides, transferring fine mud’s rich in organic material. The average total tidal fluctuation is about 2 meters. The climate is very hot and humid, and precipitation is abundant from May to November. The average annual rainfall is 3,638 mm. Within the Terraba Sierpe Mangroves, products are extracted by organized groups, familiies and individuals. The main income generating activity in the area comes from the harvesting of the clam Anadara tuberculosa, commonly referred to as “piangua”. There is also small scale artesanal line fishing permitted in the estuary of the Terraba Sierpe. The “pianguas” and the mangrove bark-Rhizophora harrisonnii found here have been harvested by the indigenous Terraba Indians for estimated 1,200 years. The wetland is also used by tour operators to promote the beautiful landscape, flora and fauna. Very few people live in the Terraba Sierpe Mangroves and the main human settlements are in the surrounding communities of Sierpe, Palmar and Cortes.